An induction ceremony on January 26, 2018 celebrated the 2018 Class of the Withrow Athletic Hall of Fame. To view the members of the Withrow Athletic Hall of Fame, click HERE. Note that biographies of members can be viewed by clicking on their names. Photos of the induction ceremony may be viewed by clicking HERE. 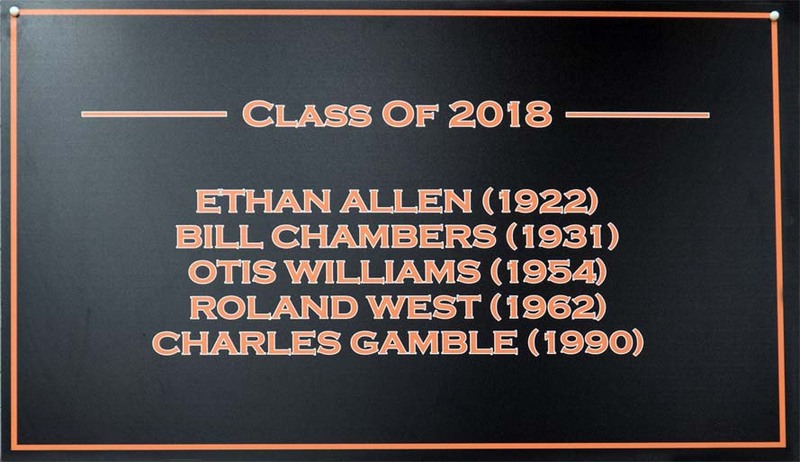 Congratulations to these five outstanding athletes who will join the 31 current Withrow Athletic Hall of Fame (WAHOF) members. There are costs associated with maintaining a strong Withrow Athletic Hall of Fame. It took too long to establish the WAHOF, especially for a school that has a strong athletic history dating from 1919. We want to ensure it continues so that we can honor those athletes, who walked the halls all of us did, for years to come. Donations may be made online by clicking HERE or by a check made payable to “WAI” with “WAHOF” written in the memo line. Please mail the check to Withrow Alumni Inc., P.O. Box 8186, Cincinnati, Ohio 45208. We do need, and thank you for, your support. A clip of the Band and Dance Team performing during a timeout may be viewed by clicking HERE.